Tra Vinh is this unassuming Vietnamese restaurant in NS Amoranto (Retiro) corner D. Tuazon. Although it is just a few blocks away from our office, D and I never had the chance to drop by and check the place out. 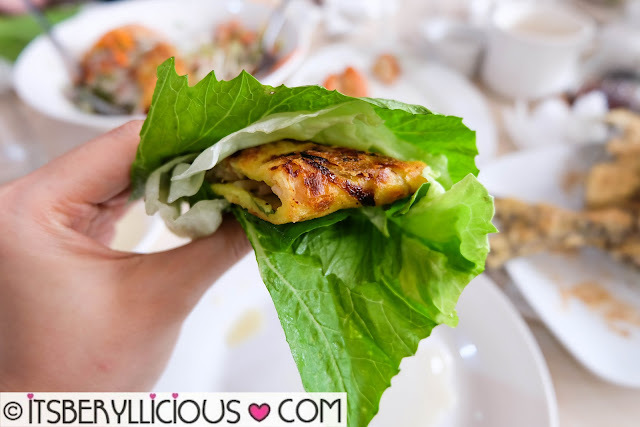 Last week, I had a fun lunch out at Tra Vinh with fellow bloggers and friends. 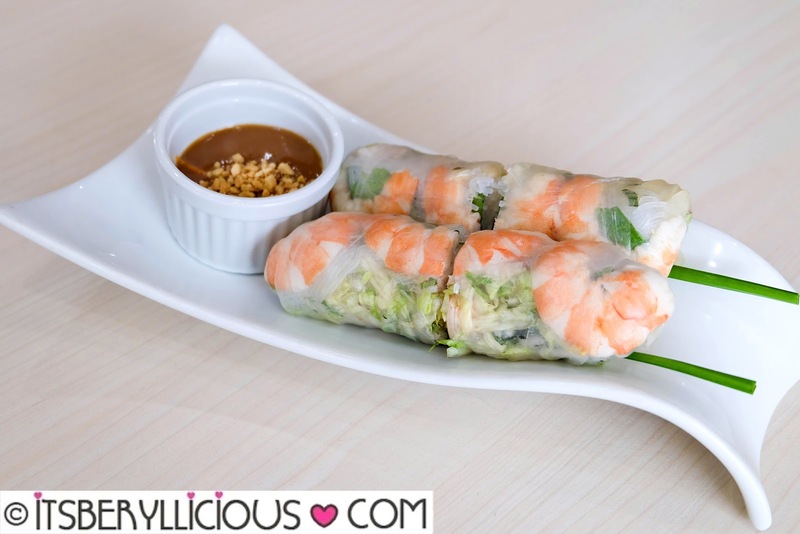 We started with an appetizer of Fresh Prawn Spring Roll (P160) served with Tra Vinh's special peanut sauce. While it may look just like your usual fresh spring rolls, Tra Vinh's version is exceptionally chunkier with fresh veggies, vermicelli, and plump prawns. Another refreshing starter was this Prawn Pomelo Salad (P240) featuring chopped vegetables w/ fresh prawns, pomelo chunks, peanuts, herbs and spices, in Tra Vinh's special dressing. 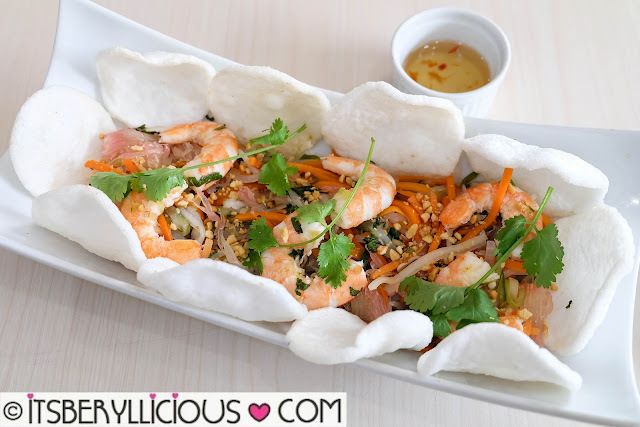 You can eat the salad together with some prawn crackers, for added texture and crunch. 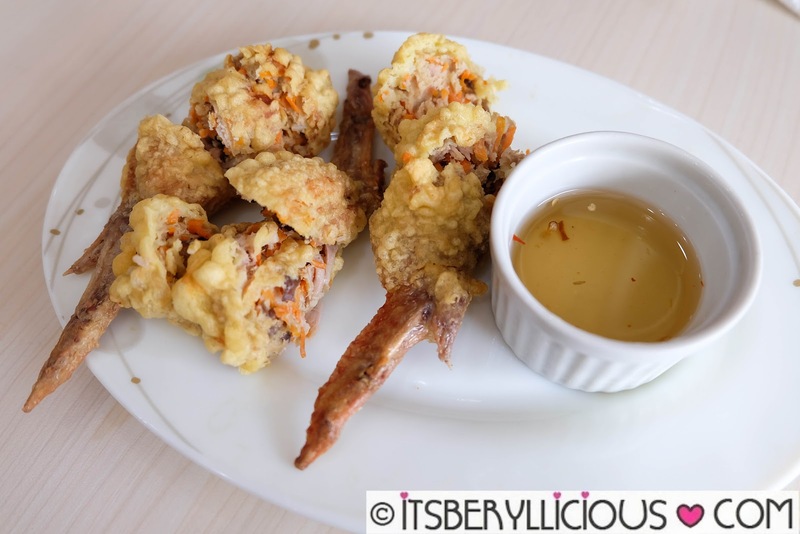 If you are more into fried appetizers, the Stuffed Chicken Wings (P165) and Prawn Sugarcane (P210) are your best bets. The chicken wings were stuffed with seasoned ground pork, veggies, herbs and spices, with a sweet and buttery aroma, while the sugarcane prawns were like prawn patties on sticks. Both were equally good and best eaten with Tra Vinh's special sauce. 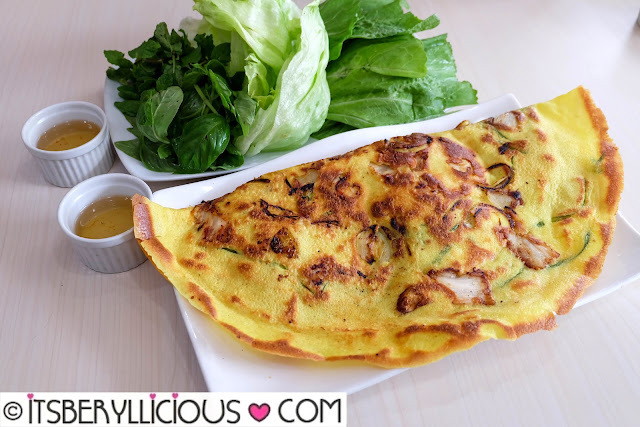 Another must-try is their huge Vietnamese Pancake (P250) served with lettuce, mustard leaves, and herbs. 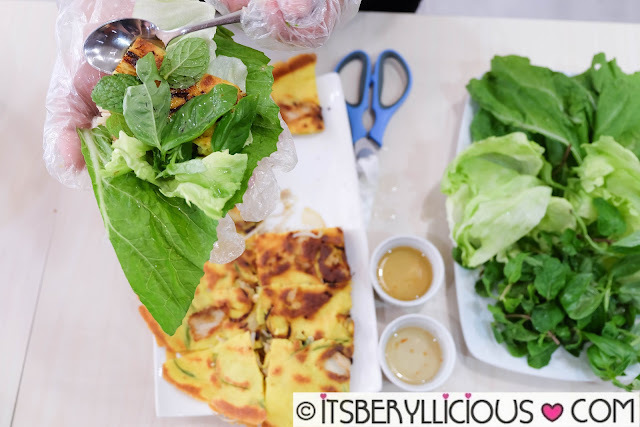 You can eat the pancake as it is, but the proper way to enjoy it is to wrap a slice of pancake with the veggies then put some sauce into it. It reminds me of how Koreans enjoy their bbq, but this time, pancake is wrapped inside the veggies instead of meat. 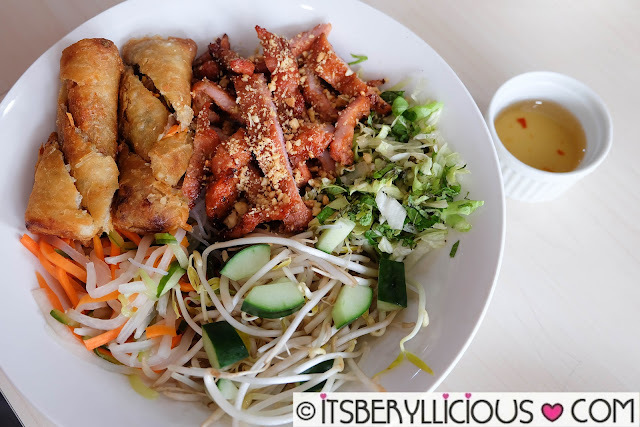 We tried a few of Tra Vinh's best-selling noodles and everything was delicious! 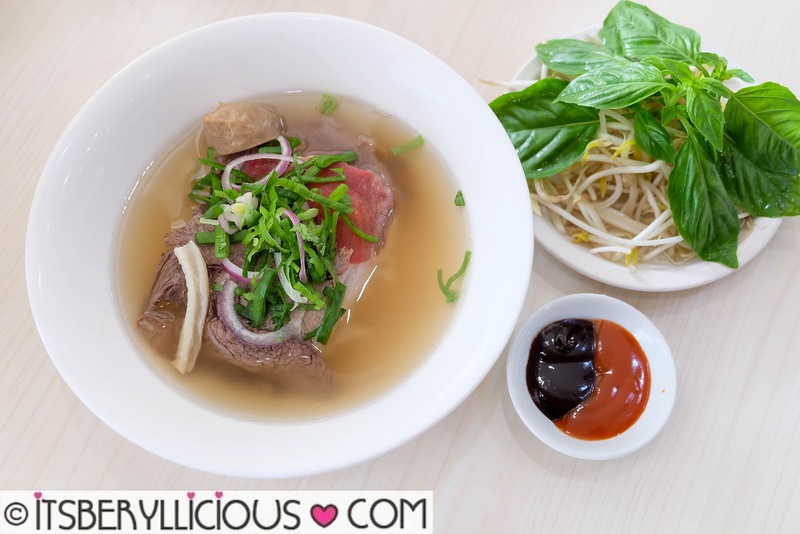 Starting off with Tra Vinh's signature Combination Beef Noodle Soup (P180/small, P230/reg, P299/large). The rice noodles is topped with tender beef shoulder, raw slices of New Zealand rib eye, beef balls, beef tripe and garnished with garden fresh herbs. Although packed with meaty flavors and ingredients, the broth remains to have this light and clean taste. Tra Vinh's signature beef broth is made with 16 traditional herbs and spices which give its unique brown color and special taste. An off the menu item is this bowl of Crab and Seafood Noodle Soup with thick broth made from carefully selected fresh live crabs. It has fresh crab meat, prawns and squid served on top of chewy soft udon noodles. I personally liked the clean and refreshing taste of Tra Vinh's BBQ Pork Noodle (P225). It is basically noodle of choice, topped with specially marinated bbq pork, roasted peanuts, garden fresh veggies, with an option to add some vegetarian fried spring rolls. 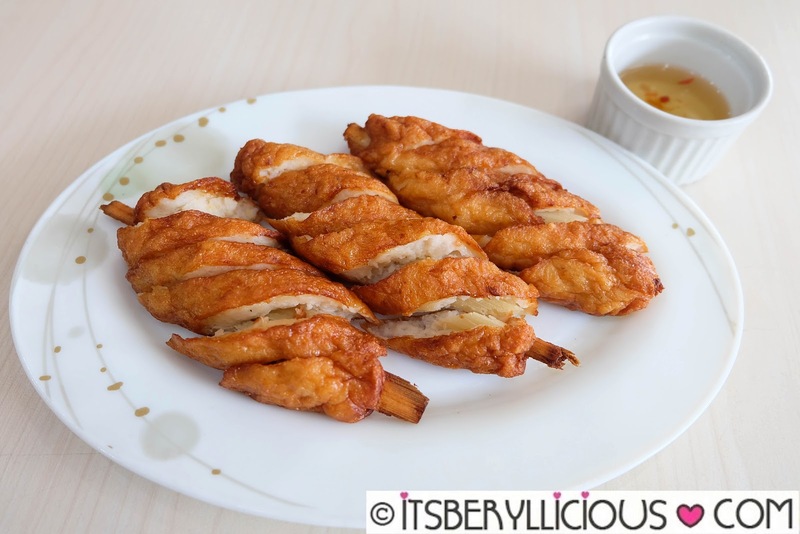 Instead of soup, the noodle is drizzled with a special dressing. It's more like a salad bowl that makes you want to dig in for more without the guilt. For ala carte entrees, we tried Tra Vinh's salt and pepper specialties. 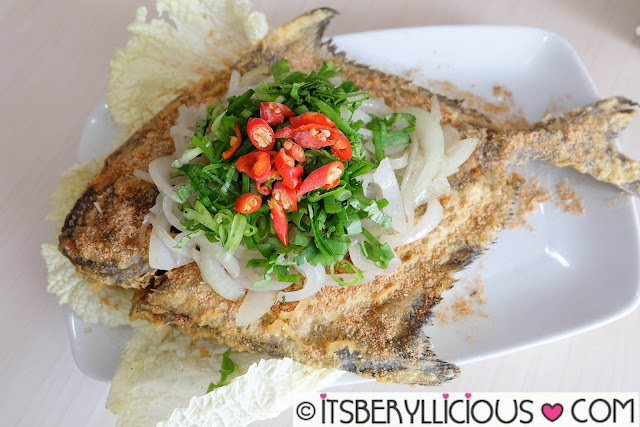 First was the Fried Salt & Pepper Fish (P599) which was pampano fish cooked to perfection, and topped with onions, herbs and chilies. 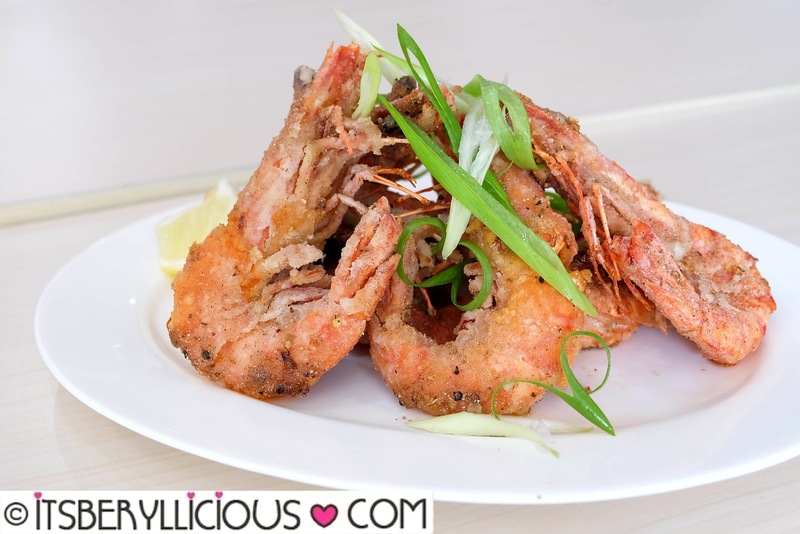 The Vietnamese Salt & Pepper Prawn (P599) on the other hand, were deep-fried jumbo tiger prawns coated in Tra Vinh's special salt and pepper mix. While both specialties are made with salt and pepper, we were told that the spices used on each dish are different from the other. 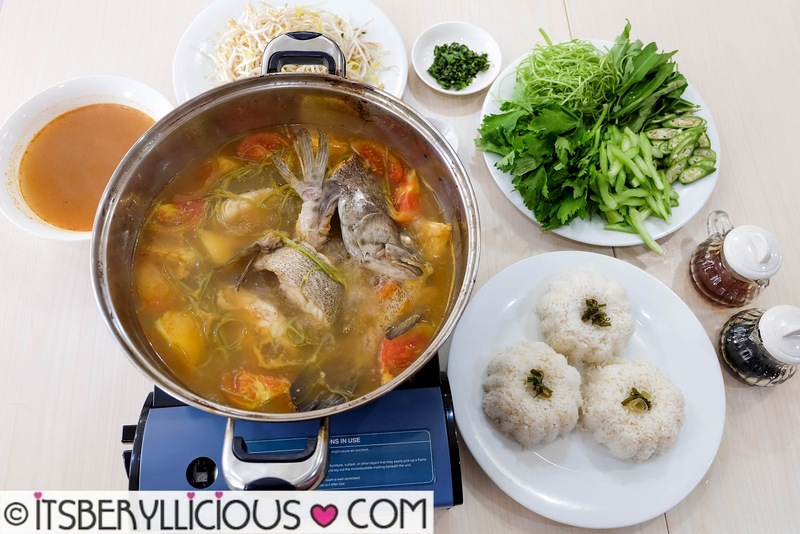 For group sharing meals, we had this hot pot of Vietnamese Fish Soup served with either rice or noodles. 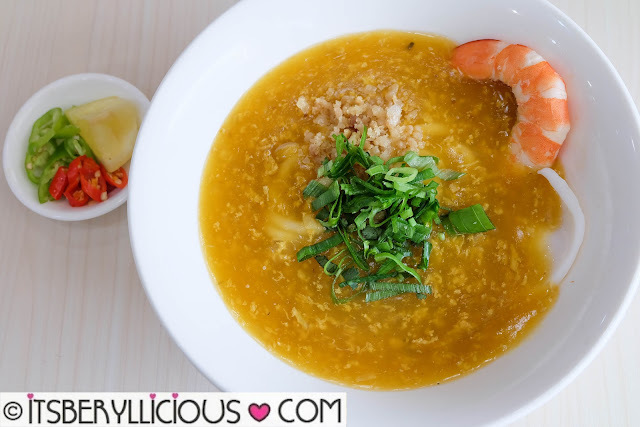 This Vietnamese specialty called Canh Chua Ca literally translates to sour soup with cooked fish. It had this sweet fruity taste with just the right amount of tang. 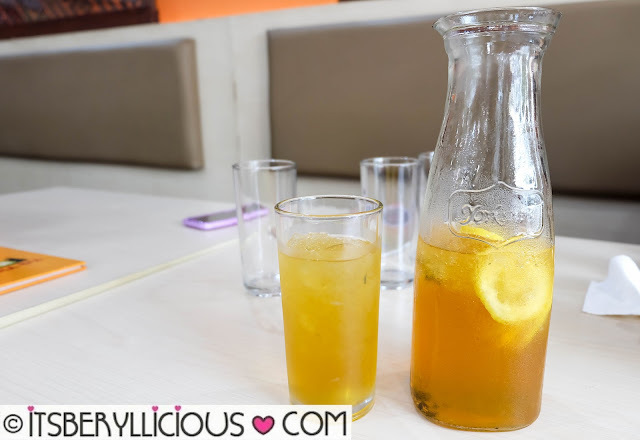 I usually skip on drinks when dining out, but Tra Vinh's Home Brew Vietnamese Iced Tea (P45/glass, P65/liter) was so refreshingly good! It was also a great palate cleanser in between all dishes we tried. Lastly, I had this Jelly Lychee (P100) for dessert. 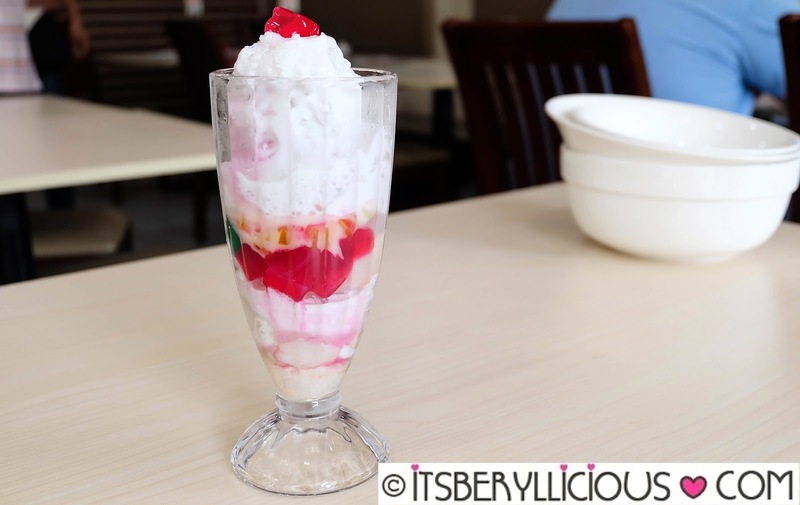 It was a unique version of our local halo-halo, made with crushed iced, fresh lychee, jello, and coconut milk. Everything we had at Tra Vinh was good! Prices were also very reasonable given the big servings. 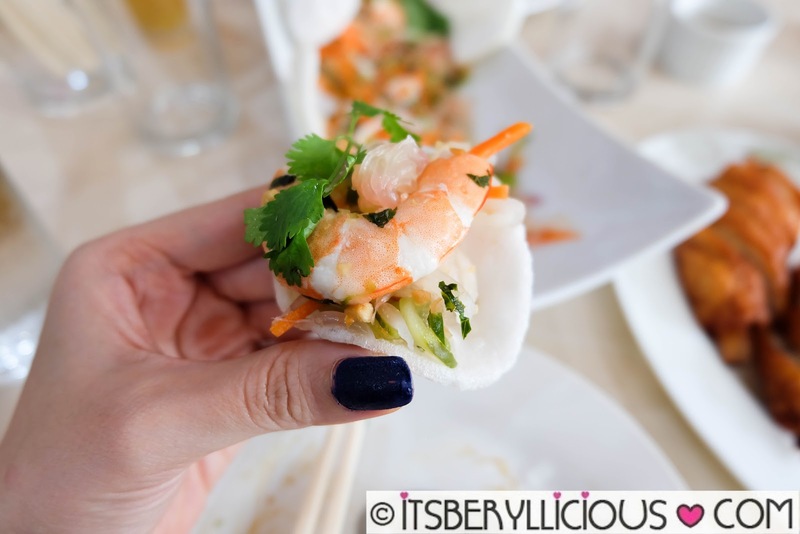 I can't wait to revisit with the family who also have a penchant for Vietnamese cuisine. My personal favorites were the Vietnamese Pancake, Beef Noodles, BBQ Pork Noodle, Vietnamese Fish Soup and Salt & Pepper Fish.